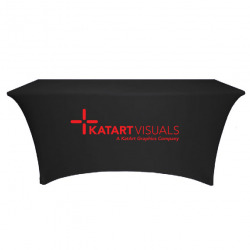 These Inexpensive Imprinted Spandex Tablecloths are a true stretch product. Notice the nice contour shape. Low cost printed Spandex tablecloths, not "cheap" stretch tablecloths. Our economical stretch table covers are very easy to install for a creative upscale look. Our Economy Printed Spandex Tablecloths have reinforced inserts sewn into the corners for easy, hassle free attachment to table legs. Price includes a 1-color line art imprint on the front panel using one of our 12 image colors. High quality logo reproduction. Choose from 20 stock cloth colors. Best prices and quality for printed Spandex tablecloths on the web. All our stretch tablecloths are Made in the USA. Our thermal transfer tablecloths are suited for indoor or short-term outdoor use. Custom size imprinted Spandex tablecloths might be available. Please email or call 800-410-0553 with your special table covering requirements. Minor layout is included in the cost of your imprinted tablecloths. Just send us your logo and we will do the rest.